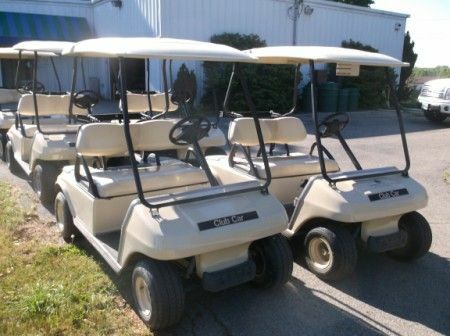 ABSOLUTE AUCTION Golf Course Equipment Liquidation 34 Golf Carts-Tractors-Mowers- Ice Machine-UTV Mule-Range Hood As agents for Columbus State Community College DBA Bridgeview Golf Course, having closed the golf course, we will sell the following equipment on the premises, rain or shine. 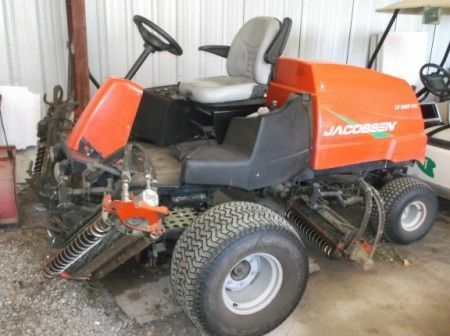 34 CLUB Car, gas, 4 wheel golf carts; JACOBSEN 2010 TurfKing IV; 4 wheel drive fairway mower; FORD low center gravity Model 2110 LCG tractor; FORD 1710 4 wheel drive w/front-end loader, FORD 2000 tractor; FORD 4 wheel drive model CM224 tractors w/4 ft. deck; JOHN DEERE trim mower; FORD CM274 4 wheel drive mower w/5 ft. deck; JACOBSEN 2700 4wheel drive fairway mower; JOHN DEERE 3235A 4 wheel drive fairway mower; TORO Greenmaster 3050; TORO Greenmaster 3000D mower; FORD grader blade; FORD rotary mower; FORD 3 pt. post hole digger; 3 pt. YORK 1987 scarifier prep tool; 3 pt. Olathe 4ft. seed drill; 3 pt. WINDMILL 560 lb. fertilize spreader; pull-type 5 HP TURFLO 4 ft. top dresser; pull-type 200 gal. 8 ft. boom sprayer; 2 shop-made pull-type trailers; pull type 5 HP air compressor; extra mower cutting units; KAWASAKI Mule All Terrain utility vehicle 4 ft bed; TORO Green Airifier; Brouwer reel-type trim mower; National reel-type trim mower; HOLLROCK 5 gang ball pickers; Range ball washer & Range ball pre-soaker wash station; WITTER 10,000 ball dispenser; DERONE ball pusher; ball baskets & 45 crates, 300 ball capacity; 4 shag bag hand pickers; card printer; golf bag racks; 18 driving range stance mats; 17 hitting mats; maintenance tools; 2 back lappers; Reel & bed knife grinders; battery charger; SPEEDAIRE air compressor; floor jack; jack stands; air hose reels; bull float; anvil; 23 radiant gas heaters; irrigation supplies to include: pipe, sprinkler heads, electric valves, controllers, wire connectors, copper wire, fittings, hose; Outdoor furniture & benches; 3 OASIS water fountains, directional metal & plastic cart signs; office furniture; conference table; cubicles; file cabinets; A/C window units; 2 ceiling gas furnaces; golf course flag poles; single plunger ball washers; tee markers; nails; rakes; stakes; yard markers; wooden lockers; beverage cart w/canvas cover & ice chest; 4x7 stainless steel NSF range hood w/fire protection; good HOSHIZAKI ice machine (like new); cutting boards; ice buckets; beer pitchers; beer signs; BUNN coffee maker; AMANA commercial microwave oven; 10 roller hot dog roller; 25” TV; chest freezer; 2 five ft. prep tables; 2 door beer coolers w/taps; 3 compartment stainless steel sink; glass display case; 10 café style tables & chairs; golf apparel including gloves, shirts & hats; new & used golf clubs, balls & tees. Personal Property Terms: Personal Property Terms: Cash or check w/photo ID paid in full at time of sale prior to removal; all sales final; sold as-is where-is w/all faults; caveat emptor. Removal of items: SUNDAY, June 23 & Monday, June 24 from 9:00 AM to 5:00 PM Contact Personnel: Kent Heisley 614.496.2005. McManus Smoked BBQ serving breakfast & lunch. All information provided is to be utilized only as a guide. Buyers are responsible to conduct any inspection. The agreement of auction is solely between buyer & seller. Stanley & Son, Inc. and its agents are exclusive agents of the seller. Any announcements made only by the auctioneer from the podium during the time of auction will take precedence over any previously printed material and/or any other oral statements made or implied. No liability exists regarding the information contained in any printed matter for its accuracy, errors or omissions.